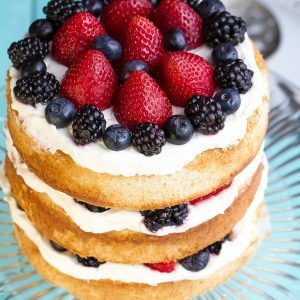 Delicious and easy Berries and Cream Sponge Cake made with layers of vanilla sponge cake, stabilized whipped cream, and fresh ripe strawberries, blueberries, and blackberries. In the bowl of a stand mixer, beat together the eggs, sugar, and vanilla until it has tripled in volume - about 10 minutes. The mixture should be thick, creamy and pale. Add the lemon zest. Add the melted butter and gently fold it into the cake batter mix. Remove from heat and allow to cool slightly (but do not let it set). Garnish with fresh strawberries, blueberries, and blackberries. Dust with powdered sugar.